Address: 13356 S. Drucilla Ln. Amazing unique 1 bdrm home located on 2 sides of the wash & great views! 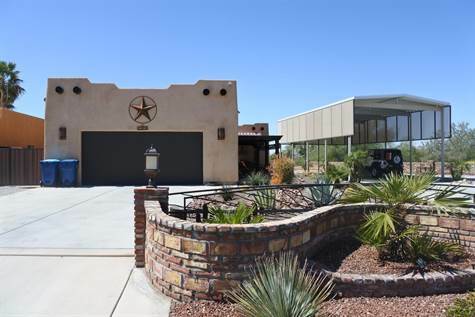 Over-sized lot approx 15,000 sq ft w/ 20x40 ft RV Port & 50 amp H-up, covered patio,huge 4+ car garage approx 30x50 ft! Plenty of room for all your toys & 4 ton heat pump just for the garage! Beautiful custom home with real wood floors, security bars on all windows & doors, 2 ac units, gorgeous kitchen with granite counters, pantry, breakfast bar, SS appliances, alarm, SW (zetta rod) & RO systems, tiled walk-in shower w/ copper sink!